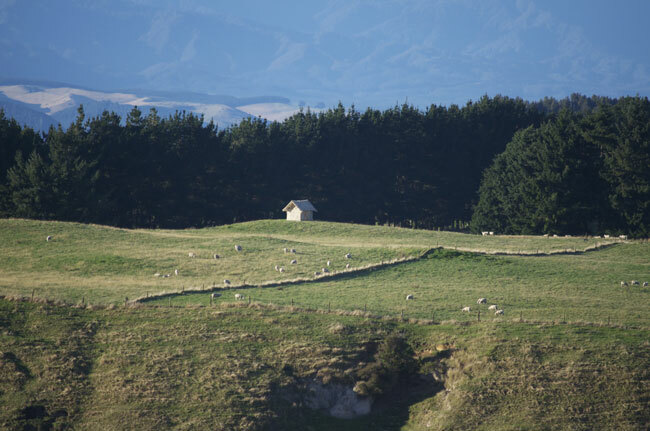 Tika Whare is a site specific installation in Turangi, New Zealand on the Te Hapua farm owned by the Truebridge family. In Maori, Tika Whare (pronounced Teaka Phorae) means true home. This 14x9x8.5 foot structure is made of materials all found on the farm, bamboo, silage netting, and the wool from the thousands of sheep that surrounded me while I worked out in the paddocks. The flexible structure “breathed” and shifted in the wind as if it were alive, but was stationary among the flock. The sun traveling through the day provided unique lighting through the wool, reminding one of light filtering through the lacy leaves of the forest nearby and the delicate design of Polynesian and Maori art. Subsequently, the transitional sculpture has shifted with the winter winds on the exposed hillside and currently resembles a structural carcass decomposing into the ground. Process is an important part of my art and every morning as I worked in the field with sheep surrounding me I was informed by their interaction with the landscape.